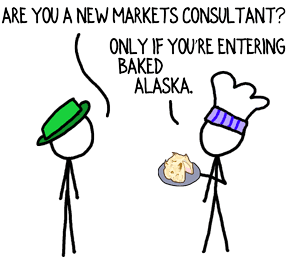 If you run a consulting firm and you’re about as good at generating new business as you are at whipping up a Baked Alaska (i.e., it’s not your forte), hiring a salesperson may seem like a natural step to augment your business. Ironically, if you’re running a boutique consulting firm and you are very good at signing clients, you also may be considering a full-time sales pro due to your frustration that no one else in your organization approaches your business development prowess. In both cases, the action you’re considering won’t deliver the results you’re hoping for. For small consulting firms, a full-time salesperson is like coffee beans in the roaster. The aroma is sublimely alluring, but the taste is undeniably bitter. In consulting, buyers conflate the solution and the people who deliver that solution. Danny Decisionmaker wants to look in the eyes of the person responsible for developing a valuable result in return for quite a lot of cash. That’s you, not a salesperson. Your path to becoming the obvious choice for a client is deep discovery, followed by careful tailoring of your offering to meet the client’s needs. A full-time salesperson without ongoing delivery responsibilities won’t possess the nuanced understanding required to craft a compelling offering (that the firm can deliver). This is why founder/owners tend to be the best salespeople for their consulting firms. They intuitively grasp their firm’s offering at a very deep level and are able to fluidly adapt to the prospect in front of them. In the product economy, sales, manufacturing and customer service are separated silos. (You wouldn’t expect a plant manager to carry a sales quota.) However, in small consulting firms, those functions are merged. You must generate revenue, create value and service the client. If your consulting offering becomes task-oriented, systematized, and repeatable, you resemble a product company and a dedicated salesperson is more likely to succeed. However, that shrink-wrapped product approach is not the calling card for most small consulting firms. Nor is it what clients are looking for when they consider hiring a boutique or solo consulting practice. I have only seen one small consulting firm successfully deploy a full-time salesperson and I’ve seen every other attempt fail. Should you hire a dedicated salesperson? If your firm is under $50 million/year, the answer is, No. Instead, ramp up your rainmaking by improving the skills of your firm’s consultants and practice leaders. If you’re a solo consultant, there’s no substitute for burnishing your own abilities. If you could pick one business development skill to improve at your firm, what would it be? Loved your book. Am reading some articles that you send on email like this one. One suggestion – Make it easier for people to react to your articles. Writing a comment requires person to think, compose and write down. Just ask a survey kind of question at the end of the article which can be answered with a single click. e.g. For this article, You can ask 1. Don’t agree at all. We have diff sales team and we are doing fine 2. Got a new perspective of looking at things. Never thought about it this way 3. Totally Agree, Talking from experience. So the reader can click on one of the 3 choices. This gives the article feel vibrant – like many have read it, many have been here, have thought about it. Because when you see 0 comments or very few comments, it looks like a deserted place nobody bothers coming to. Such impressions make a big difference in deciding if the person will come to your blog the next time. Great suggestion, Aaditya. My team and I often ponder what question to include at the end to encourage thoughtful engagement. You’re right that sometimes the questions take too much thought or would require a consultant to reveal information that feels too personal. Fortunately, the community that reads my articles is great and we always get at least a few, well-considered, comments on every article. Your survey idea definitely merits consideration for a future article. We need to think about how to use it to drive more comments rather than supplant comments. Thanks for sharing your insights and knowledge! Sorry I disagree with Aaditya. Relevant (non spammy) comments add further dimensions to the conversation, enhance the page content and give a small SEO boost. But having a survey, in addition to comments, makes sense if you want some actionable insights into your readership. We’ve actually included surveys in articles in the past. (For example, this one on benchmarks.) However, we’ve never used them as part of the comment/feedback process. While comments, dialogue and discussion are what we’re shooting for, we are pondering the idea of including a survey as a feedback tool in an article. Thanks for chiming in, Simon. This article is right on the money(pun intended!). No one has the passion for my business like I do. Prospective clients want to see and feel your desire to help them. While being able to close a deal is certainly important, a salesman is much more likely to appear to have that as his main priority. I want my prospect to feel that I share his goal of solving his problem, not merely securing his signature on a contract to hit a quota. Dan, your passion for your business and dedication to your clients blazes through in your comment. It sounds like you may have a solo firm, in which case fleeing from the idea of a dedicated salesman is definitely the right move. As your firm grows (if you want to grow it past yourself), part of your mission will be to invest the same passion in your team so that other consultants in the group can also make rain. Although they won’t be dedicated salespeople and won’t share your depth of understanding, they can (and should) bring in business. I appreciate you joining the conversation. I think the challenge is that most management folks view their problems as that of the left picture (product economy). Subsequently he wonder if he can get 10 regular people instead of hiring 1-2 consultants. This also mean the consultant need convince the management folk to change their view to the right picture. What do you think ? Clients don’t care what it takes to run a consulting firm. They don’t see a Venn diagram at all, and whether or not you have to make rain is irrelevant to them. All they want is a reliable, credible, efficient solution to their problem. In most cases, they will turn to internal staff first if there’s any way at all to use them. Inertia is our #1 competitor and internal staff is #2. I’m glad you underscored that point. David, I believe the topic Ramzani has brought up leads to a separate post: how to switch client’s thinking from product to service/behaviour. In my industry – industrial energy management – I come across this situation disappointingly often: to reduce electricity cost client wants to change bulbs (product), while we see that flipping a switch (service/behaviour) will have a much stronger effect. The topic is officially in my “article ideas” folder. Of course, we’re dealing with basic human nature: people will opt for an easy solution that appears inexpensive and gives immediate relief over a solution that seems complex, initially expensive and risky… even if the latter would ultimately be more effective and efficient. The article topic request is duly noted! This is a great way of conceptualizing a common problem – for sure. It just takes a lot of knowledge to sell for a consulting firm. And it’s not something you can just put someone in to plug and play. “Plug and play” captures the misconception very neatly, Shawn. Many consulting firm leaders are looking for an instant sales solution when they consider a dedicated salesperson. As you point out, that simply isn’t going to work in most cases. This has certainly been my experience, though with one slight caveat. Most client’s worlds are full of people (vendors, consultants, etc.) trying to get a foot in their door. The world is highly competitive. If a prospect has budget, appearance of budget, potential for budget someday, know someone with budget, etc. business development / salespeople are trained to seek them out relentlessly and build a relationship. But clients need a reason to talk to you. They need to see value in some form. Pure salespeople (in consulting) rarely are able to credibly offer a client value, at least in their initial interactions – or enough to even get a meeting. Client relationships in B2B are long term – rule of thumb 8 – 12 contacts over 8 – 12 months to earn sale. After this, 1-2 additional years to build to strong advocacy. That does not lend itself well to traditional sales model / salesperson who is not likely to develop a long term relationship. The far better model is the great consultant who develops strong selling skills. And as your firm scales and you develop client account specific leaders, ensuring they develop strong sales skills. The caveat was that I have seen pure sales / salesperson work – similar to your comment in the article – it was the exception. In both cases, the person was an exceptionally strong consultant who developed exceptionally strong sales skills, and delivered very significant results. Your rules of thumb are intriguing, Tom. The consulting sale takes trust and building trust often takes at least the 8-12 month time frame you suggest. While thought leadership can shorten the timeline dramatically, by its very nature that trust accrues to the thought leader, not to a proxy such as a salesperson. You’ve seen one exception and I’ve seen one exception. Probably every consultant has seen that one exception, which is what keeps the hope alive that maybe hiring a salesperson can work. Alas, I’m here to squash that hope! Helping the strong consultant to develop strong sales skills is, as you say, the answer for most small consulting firms. Nicely put, Tom. Training even a thoughtful consultant to sell is difficult; I’d know since I have been doing this for years. It took me years to really appreciate that selling is not a necessary evil stage of a consulting project, it’s a skill in its own right. However difficult it is to train a consultant to sell, training a product salesman to be a consulting salesman is even more difficult. As you said it, at selling stage Denny must see eye-to-eye the person who will deliver. Very true, Anatoli. Not every consultant is cut out for rainmaking. Leaders of firms tend to have what it takes, and inside most boutiques there are a few consultants who have a rainmaking spark that can be fanned into a flame, with some guidance, training and coaching.